You can watch people frost fancy cakes, apply perfect make-up, or do their workout routine (during which they are likely wearing a lot of that perfectly applied make-up and very little clothing.) People perform crazy yoga moves that I don’t understand, share incredible recipes that I add to my ever growing collection, and every other week you can participate in some sort of crafting insta-along…. and I’m a sucker for a no consequence crafter challenge. There was Me Made May (#monthoftheawkardselfie)– during which the on-line sewing community wears, records, and reflects on their hand-made wardrobes. Super fun. So many selfies. I wore something I’d made every week day for the month – including for the 72 concerts I had… okay, five concerts, but it felt like 72. You can see the outfits I managed to catalog on my instagram (obviously). A few other favorite “a-longs” are Slow-Fashion October, Summer of Basics, BPSewvember, and there are constantly make-alongs/knit-along/sew-alongs happening… I generally have high hopes to participate in all of the things, only to realize I’m still not done with the last insta-challenge I joined. And used the highly mathematic “knit a little and lay it on top of a sweater that fits” construction method. I’m confident that I goofed up the sleeve/lack of shoulder slope shaping. Hopefully I can get creative and remedy the fit problems that no doubt exist. With any luck I’ll have this ready to wear by the time the temperatures dip below 100 degrees. Speaking of 100 degrees… it’s stupid hot here lately. We escaped to the mountains in June and I needed a tent-worthy knitting project. My sweater was a no-go option due to the fact that I’m making it up and have no written stitch counts (refer to previously mentioned “lay it on top of other sweater and guess” method). Apparently I can’t get enough log-cabin, because I decided to make a pair of log-cabin mitts. I threw my knitting in my hiking project bag, and hit the trail. I was super bummed that I couldn’t find any beautiful places to knit. Colorado has no modesty sometimes. It was a beautiful week in the mountains – we camped, we hiked, and I managed to not die on my mountain bike – which is fortunate, because that meant I was able to finish the body of the mitts on the car ride home. 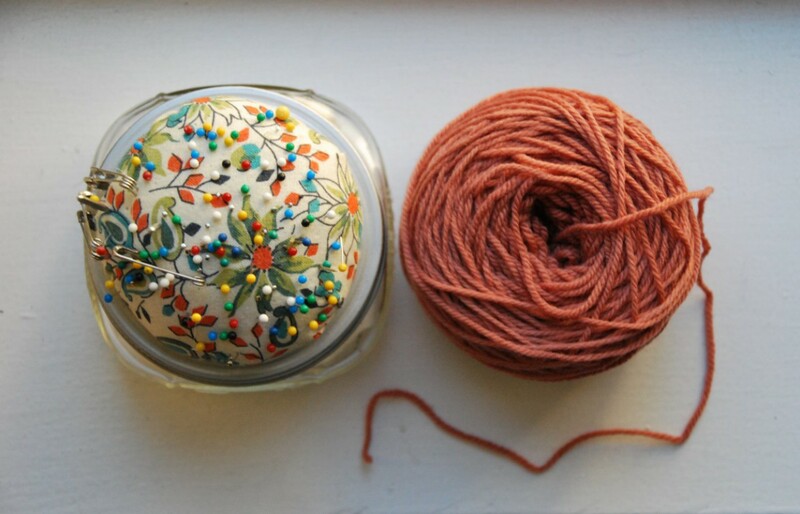 I only have this much yarn left for the thumbs though…. Will it be enough? I’d cross my fingers, but it makes it hard to knit.